Kiwa Latin America in Peru and Kiwa Italy show the first tangible result of their international cooperation. Last week, Kiwa Latin America’s first ISO certificates were handed over to the Damont Group. The Damont Group, consisting of Damont Ingenieros SAC and Damont Maquinaria SAC companies, provides industrial equipment inspection and certification services, as inspection body with the INACAL accreditation. It also separately offers related training to welding professionals thanks to its connections with international partners. The company now has an ISO 9001, ISO 14001 and ISO 45001 certificate. 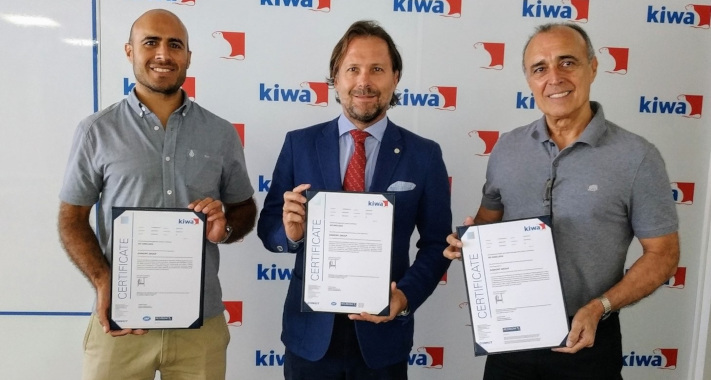 Giampiero Belcredi of Kiwa Italy: “These first certificates issued in Latin America are an important step in extending the awareness of our group as a top player in the South American market. It’s a first step on this continent, but we’re sure more will follow." Kiwa América Latina in Peru has already been active in the field of inspections for the agri-food sector and in specialized training activities related to quality. It is their aim is to subsequently expand the supply of certification services in accordance with ISO standards also to other countries in the area.